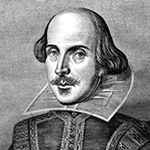 The best way to sum up stock market performance in the first quarter of 2016: much ado about nothing. The S&P 500 Index closed at 2,043.94 on December 31, 2015. As of the end of the first quarter, the Index finished at 2,059.74—an increase of 0.8%. A real yawner of a quarter. But remember that the new year began with a touch more excitement. 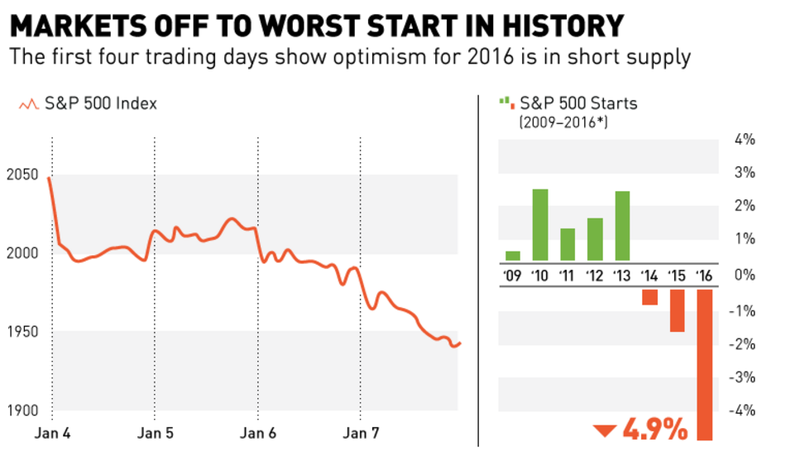 Charts and headlines similar to the one below (“Markets Off to Worst Start in History”) told us that optimism for 2016 was in short supply. Funny how that’s always the case when the stock market is declining. Source: Visual Capitalist, January 8, 2016. In the real economy, the more a commodity declines in price, the more we consume. When the price of an airline ticket or a meal at a favorite restaurant is slashed by 50%, we respond. Gasoline is one easy example to understand. As the price goes down, we get more value (miles that we can drive) for our money, so we buy more. But when it comes to “investment goods,” such as common stocks, we humans have a fatal attraction to what’s hot, and a fear and loathing of what’s not. Even though we may conceptually understand that price and value are always inversely correlated, for the overwhelming majority of investors it’s not how we act. Instead, and perversely, investors tend to judge the “value” of an investment good by its price momentum. Meaning: The more we see the price of a stock (or stock market index) go up, we think it’s more attractive. Why? Quite simply, the more the price of an investment goes up, the more we think it’s got prospects for rising even further. Of course, this is counterintuitive and makes no sense at all, but it’s the way we are wired as humans, and largely explains why most people are such terrible investors. Exhibit A is the annual DALBAR study which documents how investors in equity mutual funds manage the remarkable achievement of—consistently, measured over any time period—earning just about half of the return available from the asset class. And the flow of funds into and out of mutual funds (buying high, selling low) is another macro-level corroboration of this phenomenon (see related article: Buy High, Sell Low?). The all-time high of the S&P 500 was 2,130.82, which was reached on May 21, 2015. From its bear market low of about 677 on March 9, 2009, the S&P 500 tripled in 6 years. For some people, it’s easier to think in dollars than in index points. So here you go: In March 2009, the market capitalization of the U.S. stock market was about $8 trillion. As of the end of first quarter, it stood at about $23.7 trillion. From March 2009 to August 2015, there had been no corrections (i.e., declines of at least 10% in nearly four years). Then we finally had one: On August 25, 2015, the Index dropped 12.4% from its May peak. In the first quarter, the market experienced its second correction within six months. Measured from the May 2015 peak to the February 11, 2016 capitulation low of 1,829.08, the Index declined by 14.2%. For historical perspective, since 1980 the average intra-year decline of the S&P 500 has been -14.2% (see chart below). Interesting coincidence? 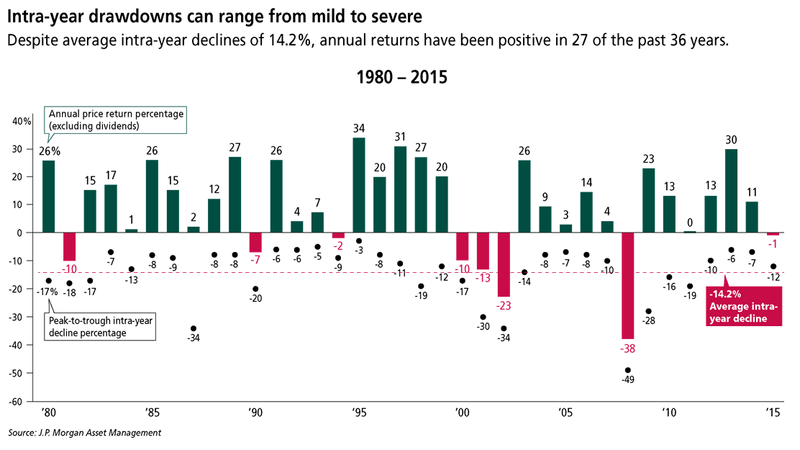 From the May 2015 peak to the end of the first quarter, the S&P 500 experienced a price change of …-3.3%. Add back dividends, and the total return from the all-time peak was -0.9%. In other words, not the end of the world. Statistically, we’re overdue for a bear market (i.e., a decline of 20% or more). Although we came close in 2011 with a 19.4% decline, it’s been seven years since the last bear (compared to a historical average of once about every five years or so). And just as the world didn’t end when we had the worst start in history, the world also won’t end when the next bear market comes, and then passes, as they always have. For the rational, long-term investor, it will be much ado about nothing. Sources: Standard & Poor’s and The Wall Street Journal.